Along with "The Expatriates," "The Ramblers" was my other read during finals. I like to read lighter books when I'm focused on other things & both fit the bill. 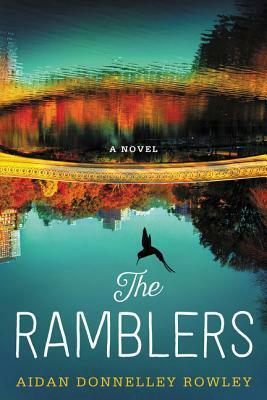 Like "The Expatriates," "The Ramblers" focuses on three characters whose lives intertwine in a large city. Here, though, how their lives intersect is not as unexpected & the plot and prose ramble a bit more. In New York City, Clio faces a decision about where she wants her relationship with her boyfriend to go. Her best friend & roommate Smith is still reeling from the break up with her ex while coping with her sister's upcoming wedding when she meets Tate, who is coming off his own separation from his wife. The novel follows these three 30-somethings over the course of a week or two as they figure out how they got to this point in their lives & where they want to go from here. are a pet peeve of mine. It wasn't enough that I put down the book, or even to make me dislike it as a whole. It was just enough that things dragged & I wasn't as compelled to pick it up again as I was at the start. Verdict: Jury's out. It won't be the first book I recommend to someone looking for lighter literary-ish contemporary fiction, due to the pacing issues. But it's probably make a long list, especially for readers interested in the privileged NYC setting. "The Ramblers" by Aidan Donelly Rowley, published February 9, 2016 by William Morrow.